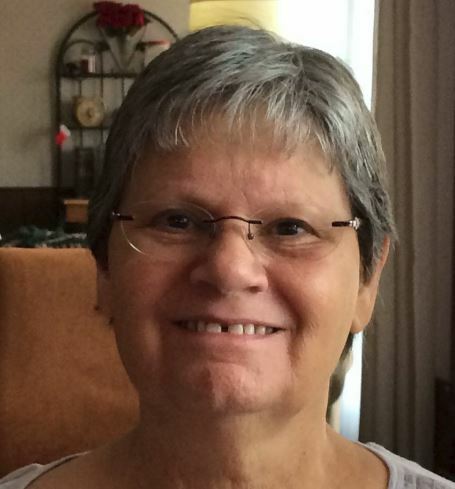 Wilma Jean Decker, age 65, went to be with the Lord on Saturday, October 20, 2018, surrounded by her family and friends. She was born November 5, 1952 in Marietta, Georgia to Wilma (Thomas) and Fred Schultz. She lived in Georgia, Michigan, and Long Island, New York before moving to Wakeeney, Kansas in 1958. She lived there with her mother and siblings and then moved to Newton in 1969 for her senior year of high school. She met Richard D. Smith there and they were married in 1972. They had two children, Melissa and Travis. They later divorced. She married Tracy L. Decker June 1, 1991, adding Tracy’s son Justin and his daughter Tania to their family. Through the years she worked for several establishments including Gibson’s, Alco, Wen’s One, and Lashar Steel. She also worked in several capacities at Northview and most recently as a bank teller for the Walton State Bank. She had many hobbies and interests including crocheting, rock and gem collecting, and gardening. She was especially passionate about helping others through Alcoholics Anonymous. She used her skills and talents to help others struggling with addiction. She was always a friend they could count on and offered loving counsel that they could trust. Most recently her interest and passion for politics grew and she found herself volunteering a large amount of her time with the Harvey County Democrats. She loved going to “the office”. She was trying to make a difference in the world. She also loved cats! She had many over the years with several of them being adopted from the Humane Society. She loved travelling, especially to Colorado. She was very detailed oriented and loved the planning almost as much as the trip! They spent many years travelling, camping, and boating. She loved the outdoors. This year they even travelled to Seattle where she had the honor of officiating the wedding of her niece. Finally, she was a devoted wife, mother, grandmother, and great-grandmother to a growing family. She spent many hours with them. This brought out her fun-loving creative side as she loved to do crafts and projects with them. She is survived by her husband Tracy, her sons Travis Smith (Nicole) of Newton and Justin Decker (Shandy Lett) of Peabody, her daughters Melissa Roseberry (Pete) of Newton and Tania Jensen (Daily) of Rose Hill, her sister Connie Schmidt of Wichita, 14 grandchildren and 2 great grandchildren. She is preceded in death by her mother and father, brother (Brent Merydith), brother (Rick Shultz), sister (Faith Hayworth), and daughter-in-law (Alycia Decker). A viewing will be held at Petersen Funeral Home in Newton on Tuesday, October 23 from 5 PM to 9 PM with the family present from 6 to 8 PM. Funeral services will be Wednesday, October 24 at 11 AM at Grace Community Church (1600 S. Anderson in Newton). A light lunch will follow the service. Memorials for Caring Hand Humane Society or Safe Hope shelter for victims of domestic violence and assault c/o Petersen Funeral Home. I offer my condolences to the family for your loss. Please take comfort in the promise found at John 5:28,29 of the time when we can be reunited with our dear loved ones again. Love and condolences to her family. She was a loving special lady and Heaven will be a brighter place with her as an addition. Cherish her memories until we join her. Our profound loss is only softened by the realization of your joy of being in Heaven. You will always/all*ways be the angel on my shoulder. You are my forever friend. So sorry to hear about Wilma! Our thoughts and prayers are with you and your family! She will be missed! My condolences to the entire family. I had just found my second cousin some months ago on social media, sharing family photos, preparing for a reunion, and much talk of crocheting. I finally got to hug you and look into your shining eyes Oct. 14, just one week ago. My heart is broken, as is so many others. Your kind and loving heart has earned you a special place in Heaven. My thoughts and prayers are with you all at this time of great loss. Wilma was a beautiful soul and will be missed by many. May God’s strength and comfort be with you all.RIP sweet friend. She was a great inspiration to me & will be greatly missed. My love to all who will miss her. We will meet her again when our time comes. I am sad that I could not be at the service but my thoughts and prayers are with you all. My thoughts and prayers go out to your family during this time of great loss. I was a classmate of Wilma’s in WaKeeney many years ago. May God hold you all in His hands. We will miss her greatly. Speaking for myself and many others,,,,we will miss her smiles, her laughter, her good humor, and the hope she instilled in others.